Some cochlear implant systems include a remote control for the processor. The functions of any remote can be divided into two classes. 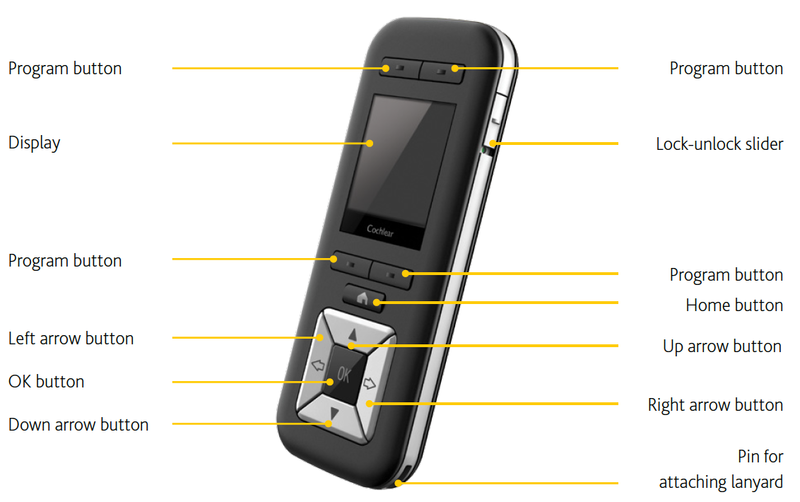 First, the remote can be used to make common adjustments such as volume and program selection. Some users may need to adjust microphone sensitivity (different from volume), and that can be accomplished with a remote as well. Additional functions such as activating the telecoil or auxiliary input may also be accessed from the remote. Caretakers, small children, or users with limited dexterity may find it easier to change settings on the remote than on the processor itself. Second, a remote can be used to indicate whether the implant is functioning properly. Of course, an adult or older pediatric user can detect immediately when the battery dies or there is a malfunction. All processors communicate with the implant (telemetry) and have the ability to indicate the status of the system with a status LED. Adult users generally disable the LED. It is a convenient check for young children that doesn’t require passing a remote among caregivers and teachers. And training caregivers is trivial – just look for the little green light. Generally a red light indicates a problem. With or without a remote, all cochlear implant users eventually become adept at debugging their systems. One advantage of being bilateral is that you always have a set of spare parts to try and isolate a problem. For example, if a battery dies, and you don’t have extras handy, you can swap them between processors. If you suspect a problem with your headpiece, interchanging the headpieces between sides will verify that or not. A remote makes it easy to make adjustments and switch programs, but it is also one more thing to carry, which can be lost or broken. If the remote has a rechargeable battery, you have to make sure that it is charged. On systems that have controls on the processor, you have a choice of ways to make adjustments. The Naída CI Q70 processor can be controlled by either of two remotes. The myPilot full-featured remote includes the ability to read back status from the processor(s). The ComPilot can change volume and program settings, but does not have the ability to read back processor status. It does, however, serve as a Bluetooth streamer device, and can accept direct audio inputs to be streamed to one or two processors. The Neptune processor does not have a remote. The Naída processor can be controlled by either the myPilot bidirectional remote or the ComPilot Bluetooth streamer. The ComPilot can change volume and program settings, but cannot read processor status. The program slots are generally used when trying some new settings. It is advisable to keep your previous favorite program in one slot. Some users experiment with a separate program to optimize music or noise, but most generally end up with one program for everything. The telecoil cannot be activated or deactivated within a program. For telephone use, most users hold the phone up to the microphone (especially the T-mic, which is located for normal positioning of the phone). For those who prefer the telecoil, a separate program can be set up with the telecoil active. The Neptune processor is off the ear, and has much larger controls than a BTE processor. In addition to a volume knob and a program switch, there is a sensitivity knob. You may choose to disable the sensitivity knob, or at least reduce its adjustment range. The controls for the Neptune are on a module called ‘Neptune Connect.’ This module may be removed after the program and volume have been set and replaced with a simple cover that contains no controls. Because AutoSound continuously adapts to different listening environments, and the controls are not available for inadvertent changing of settings, this is an appealing configuration for both pediatric and geriatric users. The Nucleus 6 processor has two programmable buttons. In Simple Mode, one is the power button, and the other turns on and off the tele coil. To change volume in Simple Mode, you must use the Remote Assistant. In Advanced Mode, the various types of presses on the processor buttons control the volume, sensitivity, program, and tele coil. The Nucleus 6 is generally set up with four programs for different listening situations. Presumably any slot can be used for any group of settings. With the default icon display of program settings, the Remote Assistant assumes that the programs are for Everyday, Noise, Focus, and Music. For bilateral users who change settings often, the Remote Assistant is especially useful. It can control both processors at once, so you can control volume or program selection with single button presses. The Remote Assistant can be set to Simple or Advanced mode (this information is not in the User Guide). The simple mode allows you to control program setting, volume, and sensitivity, and telecoil. You may also check the processor status, pair the remote to your processor, or reset the processor. The advanced mode adds more control over settings and troubleshooting. MED-EL has taken a different approach to a remote with the OPUS 2. The processor has no controls other than a power switch. This allows the processor to be the thinnest on the market, and may be a step towards a future waterproof processor. The OPUS 1 includes the controls on the processor. MED-EL processors include Automatic Sound Management to make adjustments for different listening environments. The MED-EL FineTuner Remote allows users to change settings ‘on-the-go’ without removing the processor from the ear. The FineTuner has an intuitive set of controls – volume, sensitivity, telecoil, and program selection. It also has LED indicator lights for status and some functional feedback (such as which processor of a bilateral pair is being controlled). Automatic Sound Management is intended to free most users from having to make frequent adjustments to their program, volume or sensitivity as they change listening environments throughout the day. Recipients who frequently make changes to their settings and/or use the telecoil setting regularly will be more likely to carry the remote. The FineTuner is not necessary for troubleshooting the processor. The battery lasts at least one year, after which it is easily replaceable. The design is user-friendly for people with vision, technology, or fine motor limitations. Neurelec does not offer a remote. The processor includes a four-position program switch and a volume knob.